When you receive a payment that matches the invoice as billed, you will record the payment received in the Portalbuzz system. If a payment received does not match the invoice, you will first need to determine the discrepancy. 3. 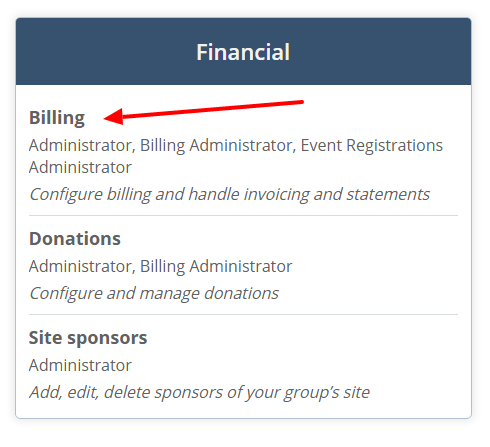 To receive a matching payment, locate the invoice from the list shown or if the list of members is lengthy, you can locate the invoice by performing a search. Click here to learn how to do a search. 4. Locate the invoice on the page, click the button to display more actions in the row of the invoice and then select Receive payment from the drop-down list. 5. In the receive payment popup box, enter the payment date. Determine if you want to track the date received, date entered, etc. The date defaults to today’s date. 6. Type amount received in textbox under received amount. 7. Enter any notes in the Payment notes textbox. 8. If you created a batch and it is open, you can add the invoice to the batch by selecting the option from the Add to batch drop-down menu. 9. Click Save. This completes receiving a payment. You can also receive a partial payment by entering the amount received if lower than the invoice total.